The Cancer Biology Graduate Interdisciplinary Program trains predoctoral and postdoctoral trainees for careers in cancer research through an interdisciplinary program that involves faculty from a wide range of disciplines at the University of Arizona. The Program offers course work and research opportunities leading to a Ph.D. degree in Cancer Biology. A major goal of this interdisciplinary program is to provide trainees with an exciting and stimulating academic environment that inspires innovative cancer research, provides a foundation of knowledge in the basic science disciplines related to cancer research, and exposure to the challenges faced by clinicians that treat cancer patients. The curriculum introduces students to knowledge derived from research in the production, properties, and therapy of cancer and assures that students have the necessary background to become independent investigators. Program activities encourage the development of students’ critical thinking skills and their ability to communicate science findings orally and in publications. Cancer Biology GIDP students are admitted through and supported by the Arizona Biological and Biomedical Sciences Program. After acceptance into the Cancer Biology GIDP, students are supported by funds derived from the Cancer Biology training grant, research grants and private donations to the Program. The Cancer Biology Graduate Interdisciplinary Program administers pre-and post-doctoral training in the broad area of the study of the biology of cancer. 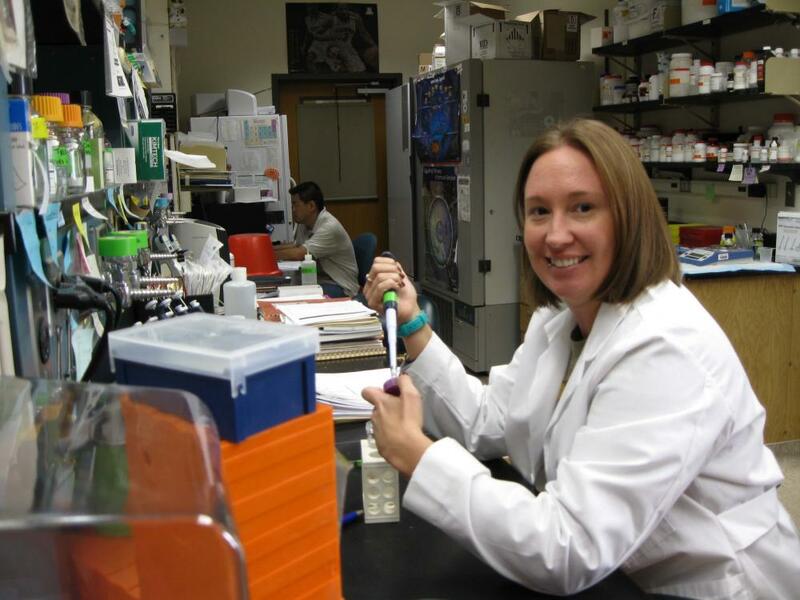 The program awards a Ph.D. degree in cancer biology. The Executive Committee, which is appointed by and responsible to the Director of Graduate Interdisciplinary Programs, serves as the executive, administrative and policy making board for the program. The organization and structure of the Cancer Biology Graduate Interdisciplinary Program shall conform to the guidelines for Interdisciplinary Programs as set forward by the Director of Graduate Interdisciplinary Programs. The responsibilities of the Cancer Biology GIDP include the administration of the graduate program and the administration of a National Cancer Institute Cancer Biology Training Grant. This grant provides stipend support for predoctoral and postdoctoral trainees. It is also the responsibility of the program to assure that the pre-and post-doctoral students in the program receive research training in the highest quality and most productive research laboratories. The program also has the responsibility to promote campus-wide interdisciplinary activities in the broad area of cancer biology through organized research seminars, retreats and journal clubs. It is essential that the program carry out timely planning and review of the faculty, the research and training programs. This is a function of the Executive Committee with the input of all of the members of the program. In the following sections, the bylaws that govern the operating procedures and policies of the program are outlined. The activities of the Cancer Biology Graduate Interdisciplinary Program are administered by the Executive Committee. The Chairperson of this Executive Committee will also be Chair of the Cancer Biology Graduate Interdisciplinary Program. The Executive Committee will report to the Director of Graduate Interdisciplinary Programs and to the Dean of the Graduate College. Chairperson of the GIDP will be appointed by the Director of Graduate Interdisciplinary Programs based on a candidate selected by a vote of the entire faculty of the Cancer Biology GIDP. Nominations for the Chair position will be accepted from any member of the Committee. The Program Chair term is a renewable 5 year term; however, it is expected that the Chairperson will not resign within one year of the submission date for the competitive renewal of the Cancer Biology Training Grant. The duties of the Chairperson of the GIDP are: a) call and preside at meetings of the Executive Committee to be held not less than twice a semester; b) call and preside at meetings of the entire Cancer Biology GIDP at least once per year and as needed; c) with the advice of the Executive Committee appoint and supervise the Standing Subcommittees on Graduate Recruiting and Admissions, Student Progress, Trainee Selection and Seminar Speaker Selection as detailed in Article II; d) administer the National Cancer Institute Training Grant including submission of competitive and non-competitive grant renewals; e) manage administrative matters of the GIDP including course requirements and changes. Vice Chair of the GIDP will be appointed by the Director of Graduate Interdisciplinary Programs based on the recommendation of the Chairperson and approval of the Executive Committee. The term of the Vice Chair is 5 years and is renewable. It is expected that the Vice Chair will not resign within one year of the submission date for the competitive renewal of the Cancer Biology Training Grant. The duties of the Vice Chair of the GIDP are to assist the Chairperson to oversee the day-to-day administrative and curricular affairs of the program and manage the fiscal oversight of the program, in consultation with the Executive Committee. Specific responsibilities of the Vice Chair are to: 1) monitor the recruitment of graduate students into the Arizona Biological and Biomedical Sciences program to ensure that the Cancer Biology GIDP is able to attract as many high quality students as needed by faculty in the program; 2) work with the University of Arizona’s Office and Instruction and Assessment and CBIO faculty to develop processes for measuring the extent to which the curriculum is achieving training goals; and 3) monitor CBIO students’ progress with respect to training milestones, including preparation and submission of an F31 grant application and publications. The Executive Committee will consist of eight faculty members and one graduate student and one postdoctoral member. Faculty members of the Executive Committee will serve a four-year term and the terms will be staggered so that two members of the Executive Committee will be replaced every year. Members of the Executive Committee will be appointed by the Director of Graduate Interdisciplinary Programs based on recommendations from the Executive Committee. One member of the Executive Committee will be elected by the voting faculty of the program after nomination by the general faculty. The term for this new member will also be four years. Faculty members of the Executive Committee may serve a maximum of three consecutive terms. The graduate student representative will serve a one-year term and will be elected by the students in the graduate program. The postdoctoral student representative will be selected by the Chair of the Program and will serve for one year. The Executive Committee is responsible for administering the graduate program and the training grant. The responsibilities of the Executive Committee include the recruitment and admission of both pre-and post-doctoral students into the training program, monitoring the progress of these students, securing and allocating the necessary funding for the training program, promotion of interdisciplinary awareness and interactions in terms of education and research related to the general field of cancer biology and advising the Director of Graduate Interdisciplinary Programs, the Dean of the Graduate College and the Vice President for Research on issues pertinent to Cancer Biology. The Executive Committee will act as the Progress Committee for postdoctoral trainees supported by the Cancer Biology Training Grant. Postdoctoral trainees will meet annually with the Committee. The postdoctoral trainee will present their research progress via the required Cancer Biology Seminar presentation followed by a meeting with the Committee or by a short presentation to the Committee followed by an evaluation of the progress. A. The Recruiting and Admissions Subcommittee shall be appointed annually by the Chairperson of the Cancer Biology GIDP with the advice of the Executive Committee. The committee members will represent the various disciplines within the GIDP. The Subcommittee will be responsible for publicizing the program, maintaining the program brochure, evaluation of applicants and recommending admission of students into the GIDP to the Executive Committee. B. The Trainee Selection Subcommittee shall be appointed annually by the Chairperson of the Cancer Biology GIDP with the advice of the Executive Committee. The members will represent the various disciplines within the GIDP. The Subcommittee will be responsible for selecting the pre-and post-doctoral trainees who will receive stipend support from the Training Grant. C. The Student Progress Subcommittee will be appointed annually by the Chairperson of the Cancer Biology GIDP and shall consist of members who represent the various disciplines within the GIDP. The Subcommittee will be responsible the evaluation of Cancer Biology graduate students as well as graduate students supported by the Training Grant. The evaluation will consist of yearly progress reports from the students and their graduate committees. The Subcommittee shall prepare a report on graduate student progress and submit the report to the Executive Committee by June 1 of each year. D. The Cancer Biology Seminar Series Subcommittee shall be appointed annually by the Chair of the Cancer Biology GIDP and shall consist of at least two members. The Subcommittee shall be responsible for soliciting the names of guest speakers from the membership and selecting the invited speakers. This Subcommittee will be responsible for coordinating the seminar and the visit of the guest speakers. The Cancer Biology Graduate Interdisciplinary Program consists of tenured, tenure eligible, non-tenure eligible clinical and research series faculty at the University of Arizona who participate in research and education in the general area of cancer biology. a. Faculty shall be nominated for membership in the Cancer Biology GIDP by submitting a request for membership and curriculum vitae to the Executive Committee. The request for membership should include a statement of interest in participating in pre-and/or post-doctoral training in the general area of cancer biology. A two-thirds majority of positive votes of the Executive Committee shall be required for nomination to membership to the Director of Graduate Interdisciplinary Programs who shall confer membership. Important criteria for membership shall include interest in pre-and or post-doctoral education, and/or demonstrated current scholastic activity in the general area of cancer biology. b. A member of the Cancer Biology GIDP shall be asked to leave the program if they fail to participate in the activities of the program. Participation in the program includes service on a Subcommittee of the Cancer Biology GIDP, dissertation director for a graduate student in Cancer Biology Graduate Program, presenting a seminar in the Cancer Biology seminar series, teaching a graduate course in Cancer Biology or continued scholarly productivity in the general area of cancer biology. Membership in the Committee shall be subject to periodic review at intervals no greater than five years. If a member is found not to satisfy those criteria by a two-thirds majority of the Executive Committee, they will lose their membership. c. Members dropped from membership may reapply for membership as outlined in Article III. A.1. 1. Non-tenure-eligible faculty who otherwise meet the criteria for membership (Art. III, 2), may apply for affiliate membership in the Cancer Biology GIDP by submitting a request for membership and a recent curriculum vitae to the Executive Committee. A two-thirds majority of positive votes of the Executive Committee shall be required for election to affiliate membership. 2. Affiliate members shall have all the privileges and responsibilities of regular members (Art. III, 1.b.) except that they shall only serve as co-directors of graduate dissertation committees in conjunction with a regular member. a. Tenured and tenure eligible members of the Cancer Biology GIDP may serve as dissertation advisors for students in the Cancer Biology Graduate Program. Non-tenure eligible faculty who want to supervise a graduate student must submit the required forms to the Graduate College through the Cancer Biology GIDP for permission to mentor a student in the Program. Students mentored by non-tenure eligible faculty must identify a tenure eligible Cancer Biology faculty member to act as co-mentor. b. Members of the Cancer Biology GIDP shall serve when asked on the various Subcommittees of the Program. c. Members shall be expected to provide financial support for graduate students in the program at a level determined by the Executive Committee. d. Each member of the Cancer Biology GIDP shall have one vote on matters brought to the Committee by the Executive Committee. A quorum shall constitute one-third of the membership. Faculty members should submit a written statement to the Cancer Biology GIDP outlining their involvement in the GIDP and noting the percentage of their total workload spent in GIDP activities. This statement should cover the period from January 1 through December 31 of the previous year. The GIDP will provide written feedback on the faculty member’s statement. These comments will be forwarded to both the faculty member and the primary department head or academic unit. The By-laws shall be amended or revised by movement of the Executive Committee.